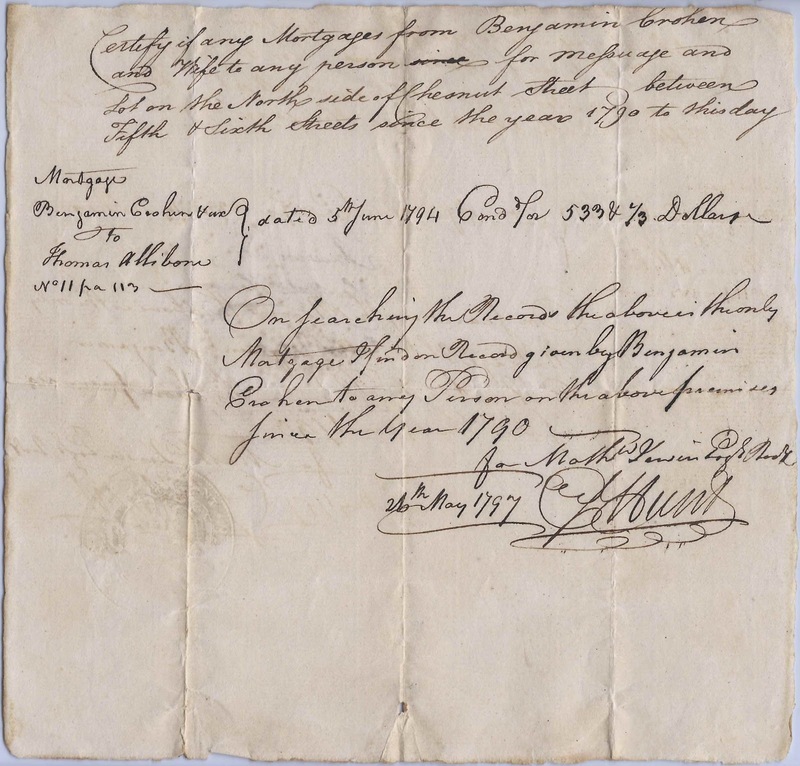 Title search of a 1794 mortgage of Benjamin Crohen to Thomas Allibone, involving a property on Chestnut Street between Fifth and Sixth Streets, presumably Philadelphia, Pennsylvania. 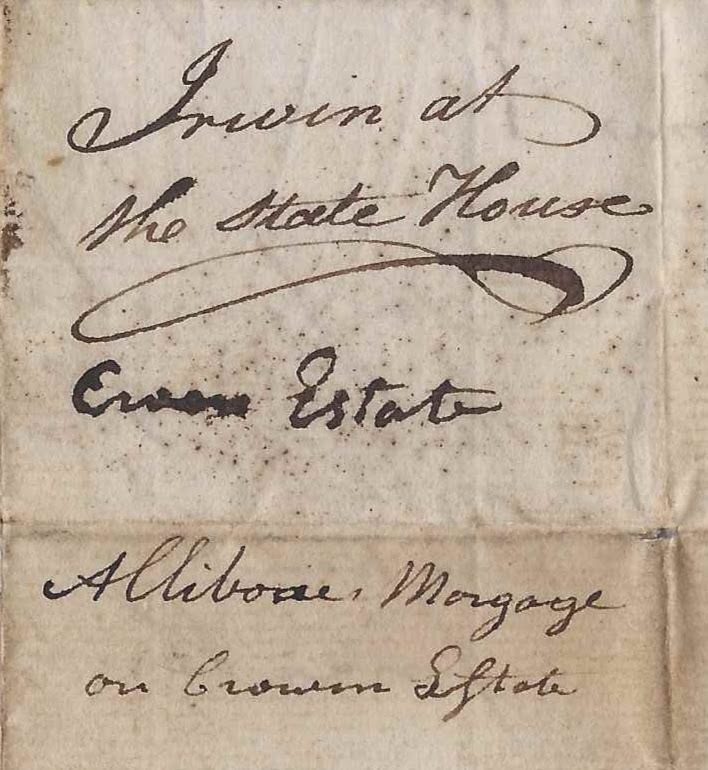 The search was done back to 1790, apparently at the behest of Mathew Irwin at the State House by someone whose name I can't decipher, perhaps Hunt, and was certified on 26 May 1797. What made me think of Philadelphia is that I found a Benjamin Crohen in an 1895 Philadelphia directory and, written as Crowen, in the 1800 Census of Northern Liberties, Philadelphia, Pennsylvania. Interestingly, the document itself shows his name as Crowen on the reverse. As Benj. 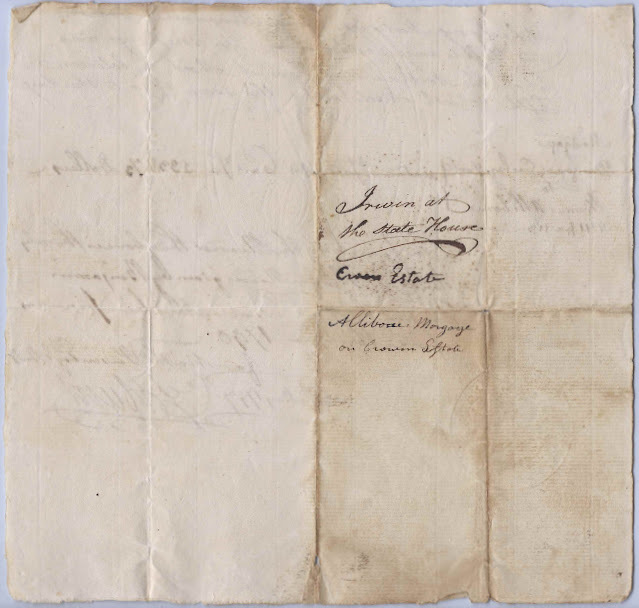 Crowen, he's listed as a member of the Second Battalion of the Fourth Regiment of the Militia of the City of Pennsylvania in 1795. 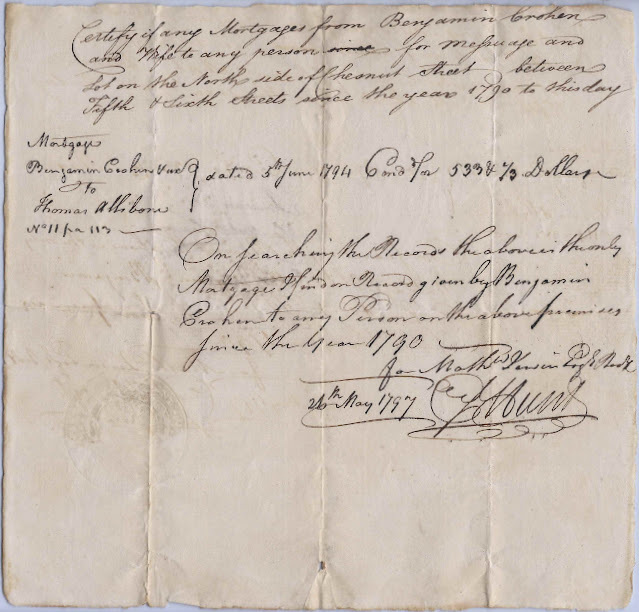 The 1790 Census of Philadelphia, shows a Thomas Allibone at Northern Liberties, Philadelphia, Pennsylvania, and in South Mulberry Ward, Philadelphia, Pennsylvania, in the 1800 Census. He may have been the Thomas Allibone whose death certificate lists his birth as 1757 and his death as 10 November 1817 at Philadelphia. The mention of Chestnut Street and Fifth and Sixth Streets would further point to Philadelphia. If you have clarifications to the information above, please leave a comment or contact me directly. Thanks!